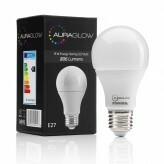 87% energy cost savings; bulbs will pay for themselves and save on your bills so each one is an investment. Delivers a Cool White Light (6000k) often preferred in working areas as it makes illuminated objects appear more crisp. This incredible E27 (edison screw) LED light bulb is only 9w in power but equivalent to a 60w incandescent light bulb.